Last Friday March 17, the Cocoon plantation in the parcel of the San Cebrián Foundation was completed. The parcel is located in the village San Cebrián de Campos, in the province of Palencia. The Fundación is a non-profit organisation that pursues the improvement of the quality of life of people with intellectual and learning disabilities and their families. The Fundación has 8 employment centres, located in various towns in the province. 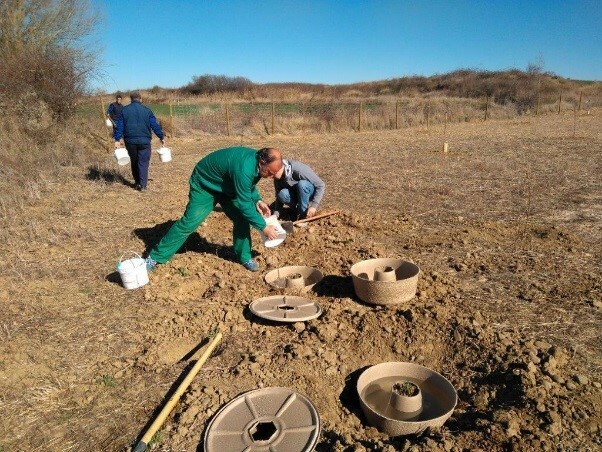 Fundación San Cebrián decided – in coordination with Volterra – to plant 37 fruit and nut trees (Figs, Almonds, Pistache, Apples and Pears) and 65 grapevines of the Tempranillo variety. Furthermore, it chose to plant 50 thistles, inoculated with mushroom strains. The ´thistle mushroom´ (Pleurotus eryngii, locally known as ´seta de cardo´) is an experimental crop that promises to be an interesting and profitable option for marginal rainfed terrains in the interior of Spain. 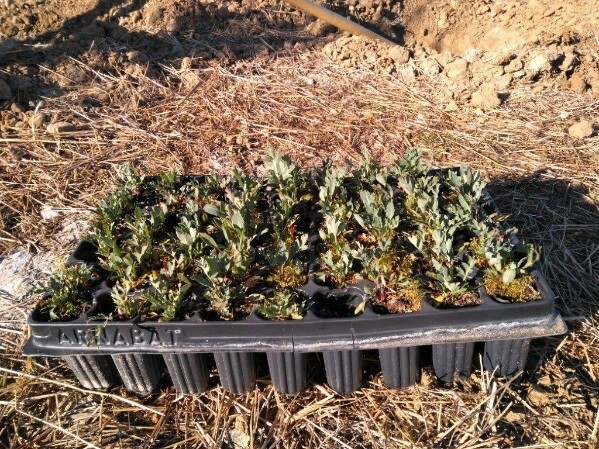 As part of the replication activities of LIFE The Green Link, part of the thistles was planted using the Cocoon method, in order to study the technology´s potential for the cultivation of this novel crop.